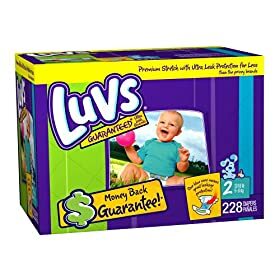 In addition to the fabulous Pampers deal, Amazon is also giving you an additional 15% off select Luvs diapers until the end of May with coupon code PMPRSJN9. It looks like most boxes already have an 8% discount, so a box of Luvs after coupns will be just $30.60. That's only $.15 per diaper for size 3s! Luvs and Pampers wipes are also included in the promotion, and so are Kandoo products! Shipping is also free since you're spending more than $25.